Paper on Higgs mode in disordered superconductors published in Nature Physics! “The Higgs mode in disordered superconductors close to a quantum phase transition,” was just published in Nature Physics! The recent paper is a theory-experiment collaboration where our theoretical predictions of a Higgs mode going soft at a quantum critical point in a disordered superconductor are put to the test in dynamical conductivity experiments. This is the first unequivocal observation of the Higgs mode in a superconductor. 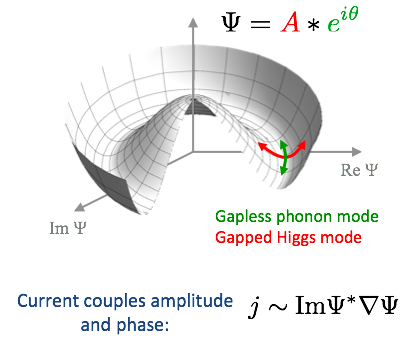 In contrast to previous attempts where there was considerable mixing of the Higgs mode with broken pairs, in the experiments reported here the energy scale for the Higgs mode could be reduced well below the pair breaking scale. Importantly, the Higgs mass was shown to vanish at the quantum critical point between a superconductor and an insulator leaving no doubt that its origin lay in the amplitude fluctuations of the superconducting order parameter. Our theory was first published in Swanson, Loh, Randeria, Trivedi Phys. Rev. X 4, 021007 (2014). Phil Anderson has written a historical and insightful News and Views on our Nature Physics paper.